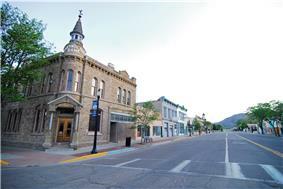 Located in Cañon City's National Historic District, the St. 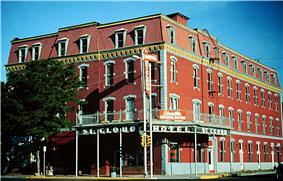 Cloud Hotel has stood at the corner of 7th and Main since 1888. It is currently unoccupied and in disrepair after a string of failed attempts to revive the business. The hotel was moved brick by brick from Silver Cliff, CO in 1888. 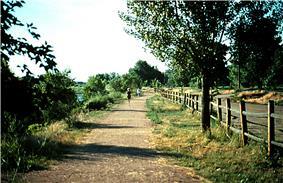 Arkansas Riverwalk in Cañon City is part of John Griffin Regional Park. It is owned and operated by the Cañon City Area Metropolitan Recreation and Park District. For other similar names see also Canyon City (disambiguation). The City of Cañon City is a Home Rule Municipality that is the county seat and the most populous city of Fremont County, Colorado, U.S. The United States Census Bureau estimated that the city population was 16,400 in 2010. Cañon City is noted for being the location of nine state and four federal prisons and penitentiaries. Cañon City straddles the easterly flowing Arkansas River and is a popular tourist destination for sightseeing, whitewater rafting, and rock climbing. In 1994, the U.S. Board on Geographic Names approved adding the tilde to the official name of Cañon City, a change from Canon City as the official name in its decisions of 1906 and 1975. It is one of the few U.S. cities to have an eñe in its name, others being La Cañada Flintridge, California, Española, New Mexico, Peñasco, New Mexico, and Cañones, New Mexico. Cañon City was laid out on January 17, 1858 during the Pikes Peak Gold Rush, but then the land was left idle. A new company "jumped the claim" to the town's site in late 1859, and it put up the first building in February 1860. This town was originally intended as a commercial center for mining in South Park and the upper Arkansas River. In 1861, this town raised two companies of volunteers to serve with the Second Colorado Infantry during the American Civil War. This regiment fought in skirmishes in nearby New Mexico and as far east as the Indian Territory (Oklahoma) and Missouri before ending its organization in 1865. In 1862, A. M. Cassaday drilled for petroleum six miles north of Cañon City, close to a known oil seep. Cassaday struck oil at the depth of 50 feet, and he completed the first commercial oil well west of the Mississippi River. He drilled five or six more wells nearby, and he refined kerosene and fuel oil from the petroleum. Cassaday sold the products in Denver. The Cañon City Downtown Historic District is a historic district that was listed on the National Register of Historic Places in 1983. Cañon City is located at (38.446800, -105.228305) at an altitude of 5,332 ft (1,625 m). According to the United States Census Bureau, the city has a total area of 12.0 square miles (31 km2), of which 12.0 square miles (31 km2) is land and 0.08% is water. Cañon City sits in the "high desert" land of southern Colorado, the same desert lands of Pueblo and Florence. The city's nickname, "the Climate Capital of Colorado", derives from the combination of unique geography and 5,300 ft elevation protecting the city from harsh weather conditions. The average daily high temperature in January is 14 degrees warmer in Cañon City than in Grand Junction even though the elevation of Cañon City is higher. Overnight low temperatures are also considerably warmer in Cañon City than in Denver. The average minimum temperature in January is 20 degrees. During July, overnight lows are 59 degrees on average. Cañon City has a semi-arid climate (Köppen climate classification BSk). As Cañon City has grown, the city has both annexed surrounding communities and developed new subdivision to create the city that exists today. Cañon City is home to many city owned parks, as well as parks owned by the Cañon City Area Recreation and Park District. Centennial Park, commonly known as "Duck Park"
Denver & Rio Grande Western Park, commonly known as "Depot Park"
The Cañon City Area Recreation and Park District, commonly called the Rec District, was created in 1965 to better serve the community's recreational needs with parks, the R.C. Icabone Pool (a public swimming pool), a dog park, an archery range and a ropes course along with a rec district office with a community room. As of the census of 2000, there were 15,431 people, 6,164 households, and 3,803 families residing in the city. The population density was 1,284.1 people per square mile (495.7/km²). There were 6,617 housing units at an average density of 550.6 per square mile (212.5/km²). The racial makeup of the city was 93.15% White, 1.59% African American, 1.04% Native American, 0.54% Asian, 0.06% Pacific Islander, 1.61% from other races, and 2.01% from two or more races. Hispanics or Latinos of any race were 8.33% of the population. There were 6,164 households out of which 28.8% had children under the age of 18 living with them, 48.0% were married couples living together, 10.5% had a female householder with no husband present, and 38.3% were non-families. 33.7% of all households were made up of individuals and 17.2% had someone living alone who was 65 years of age or older. The average household size was 2.27 and the average family size was 2.90. The age distribution was 23.5% under the age of 18, 6.7% from 18 to 24, 28.2% from 25 to 44, 21.5% from 45 to 64, and 20.1% who were 65 years of age or older. The median age was 40 years. For every 100 females there were 100.1 males. For every 100 females age 18 and over, there were 99.3 males. The median income for a household in the city was $31,736, and the median income for a family was $42,917. Males had a median income of $31,258 versus $21,849 for females. The per capita income for the city was $16,970. About 7.1% of families and 11.5% of the population were below the poverty line, including 11.9% of those under age 18 and 9.6% of those age 65 or over. Along with a police department, sheriff's office and detention center, and a municipal court, Cañon City is also home to the courts for Fremont County and the 11th Judicial District of Colorado. Cañon City is governed via the mayor-council system. The city council consists of seven members who are elected from districts. The mayor is elected by the entire city. The area being situated along the Arkansas River has allowed for soil suitable to orchards, ranching and farming, but Cañon City has slowly transitioned from an agricultural community to more of a diverse economy including not only agriculture, but tourism, education, manufacturing, medicine and many others. The major employers in Cañon City include the Royal Gorge Bridge and Park and various other attractions. Colorado Department of Corrections operates the Colorado Territorial Correctional Facility in Cañon City. In addition to several correctional facilities near Cañon City in unincorporated areas in Fremont County, Colorado State Penitentiary, the location of the state death row and execution chamber is in Fremont County. Other state prisons in Fremont County include Arrowhead Correctional Center, Centennial Correctional Facility, Fremont Correctional Facility, Four Mile Correctional Center, and Skyline Correctional Center. The Colorado Women's Correctional Facility near Cañon City in unincorporated Fremont County, was decommissioned on June 4, 2009. Prisons have served an important significance to both Cañon City and the surrounding areas of Fremont County, as well as to the state of Colorado. To learn more about the history of prisons in Colorado, the Museum of Colorado Prisons has been given the role of preserving and presenting the past of the state's corrections system. From Cañon City's Royal Gorge Bridge, there are many places to see and visit in the area. Cañon City is home to a daily newspaper called the Cañon City Daily Record, an FM radio station, Star Country 104.5 FM and a long-running AM radio station known as KRLN NewsRadio 1400 AM. Transportation in the Cañon City area consists of cab service, shuttle bus service, and a downtown wagon ride. The segway tours are also available to explore local parks such as Red Canyon Park or scenic places such as Skyline Drive. Cañon City's school system is under the direction of the Cañon City School District Fremont RE-1. The district currently has four elementary schools, one charter school, one school serving as both an elementary school and middle school, one middle school and one high school, Cañon City High School. For the higher education needs of the community, Pueblo Community College provides a branch campus on the west end of the city along U.S. Highway 50. Musician Skip Konte, "Wizard of all Northern Realms"